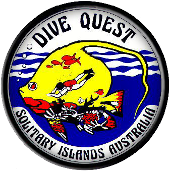 Click the Logo to visit the Dive Quest website. North Solitary Islands diving specialists and a personal favourite. The Solitary Islands - where the warm reef waters from the north, meet the cooler southern flows - producing a unique blend of tropical and sub-tropical fish life, soft corals, and spectacular marine life. 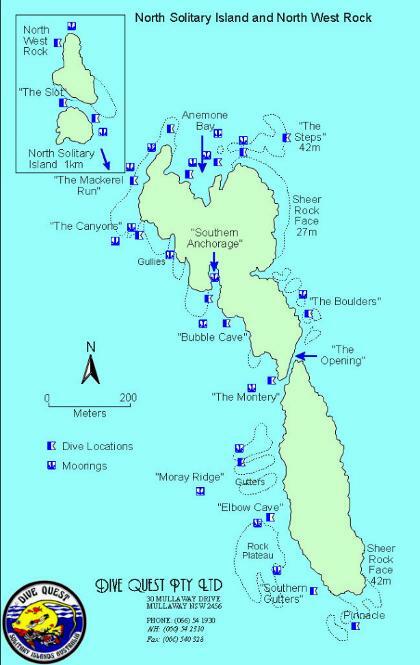 I have personally dived virtually every site in the North Solitary Islands group and most of them multiple times. I can highly recommend Chris and his fantastic team at Dive Quest. These guys were instrumental in the formation of the Marine Park and the placement of moorings around the islands to protect the sites. I do not know of any other operator that has such devotion to the protection of the marine environment. Where as Nelson Bay has perhaps the best shore diving in Australia, without doubt the North Solitary Islands, I believe is unquestionably the best diving in NSW and amongst the top 10 in Australia! 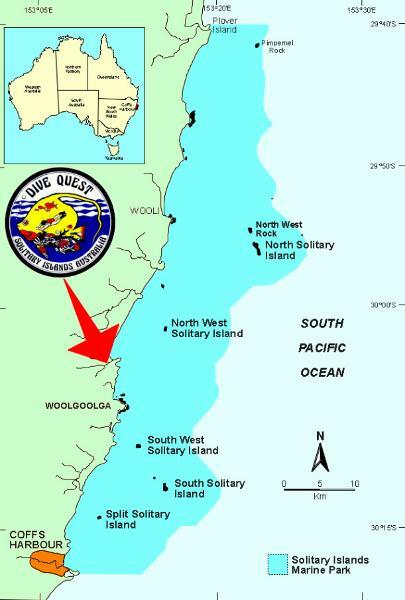 There are five Solitary islands within this unique group situated off the picturesque coastline from Coffs Harbour to Brooms Head. This area offers warm clear water almost all year. Features of the islands include sheltered bays, swim-throughs and drop-offs adorned with beautiful corals, sponges, anemones, and tropical and pelagic fish of many varieties. 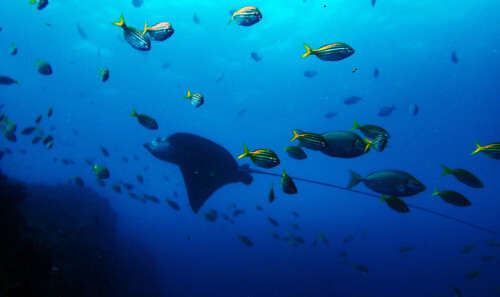 The blending of warm tropical and cooler temperate waters around the islands allows divers a multitude of dives with amazingly diverse, integrated marine communities that have to be seen to be believed. 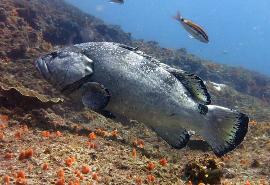 Generally speaking the South Solitary Islands has mostly temperate marine species with tropical species mixed in. The North Solitary Islands are predominantly tropical species with temperate species mixed in. 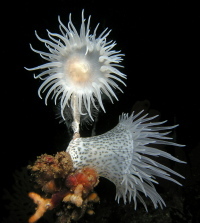 I have completed dozens of dives on the Solitary Islands, especially the northern group. This is arguably some of the best diving you will do anywhere in the world. 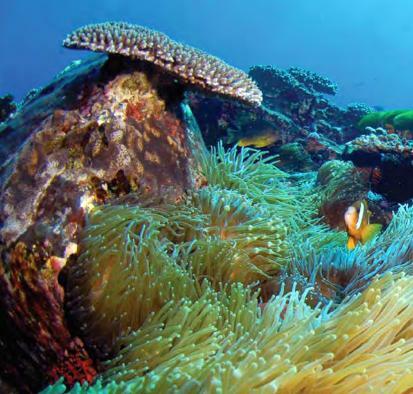 Without doubt, certainly the best reef diving in NSW and top few in Australia. Do you dive? If not, you can see what the underwater world of the Solitary Islands Marine Park looks like at the Solitary Islands Aquarium. The Coffs Aquarium is really like a window into the Solitary Islands Marine Park, which stretches north from Coffs Harbour. Because this is where warm tropical waters from Queensland meet cooler waters from the south, our part of the ocean has a unique mix of marine life. North Solitary Island is the largest of the Solitary Islands group and strongly influenced by the warm waters of the East Australian Current. 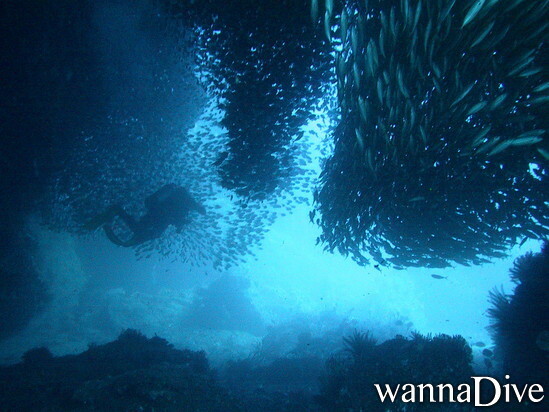 The island has dives around its circumference and offers a large variety of dives to suit different conditions and preferences. Among the vast array of marine life to be found at this dive site are schools of pelagic fish, Eagle rays, Grey nurse sharks, and turtles cruising over the dense beds of Anemones and their beautiful Anemone fish interspersed with numerous varieties of corals decorated with tropical fish. 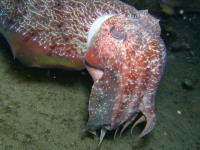 This site is one of our most popular and has something to offer divers of all levels. Depth 5 - 24 metres. A rocky drop-off 100 m out from Anemone Bay, usually patrolled by Grey nurse sharks, Black cod, Eagle rays and Bull rays. There are also large and beautiful Black coral trees and Sea whips to be seen. Depth 5 - 24 metres. 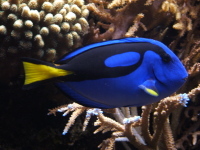 A multi-coloured aquarium of tropical fish and bottom life, and a very popular spot for Spanish dancers, Blue tang and Coral cod. Depth 5 - 24 metres. Fingers of coral covered rocky outcrops protrude southward in this area. Following these to the north leads to a cave in 8 metres of water and extends over 20 metres into the island. Depth 5 - 24 metres. This is one of my favourite sites in within the marine park. Approximately 2 km north of North Solitary Island, this rock is exposed and is in a current line. 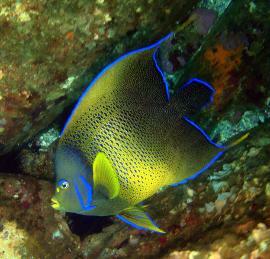 It offers superb fish life and spectacular swim throughs. Divers swim through a slit in the outcrop to enter one of the most densely populated and diverse range of fish likely to be seen anywhere!! Bream, Tarwhine, Morwong, Mangrove jacks, Spangled emperors, Mosses perch, Black cod, Trevally, Blue groper, Flute-mouths and Sweetlips to name a few literally swarm divers as they explore this significant fish dive. Depth 5 - 24 metres. 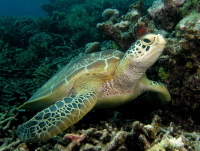 North West Solitary Island is a short distance offshore and offers relaxing diving and snorkelling. 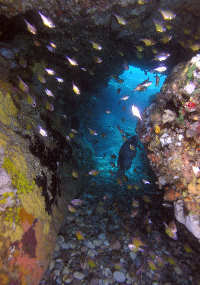 The dives offered here consist of rocky fingers and sandy gutters - an excellent location for hard and soft corals. 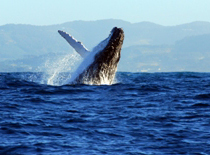 Humpback whales are regulars during the winter migration. A very easy dive with a variety of hard and soft corals, tropical fish and visits by our magnificent Manta Rays between January and June. Depth 5 - 24 metres. A pinnacle beginning in 33 metres and rising to 15 metres from the surface. 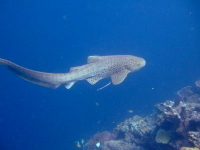 A cave runs through the bommie at 27 metres containing resident Lion fish, and frequent visitors include Grey nurse sharks, large cod and Jewfish, as well as the ever popular Kingfish. Sea whips and Gorgonian fans adorn the walls as well. Depth 20 - 30 metres. The western side of the island has a high cover of various types of plate corals, some quite large. 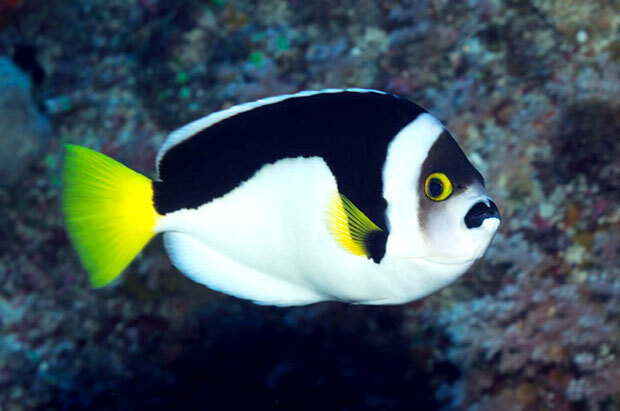 The large resident schools of Morwong, Sweep and Surgeon fish attract large predators and often large Kingfish, Tailor and Mackerel can be seen. As the name suggests, a growing population of Blue groper exists which regularly accompany divers. The depth varies between 5 - 25 metres. 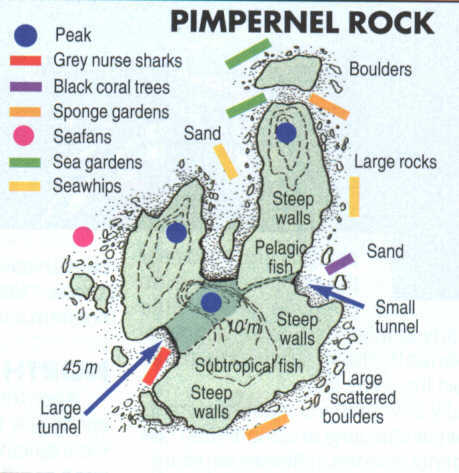 Pimpernel Rock is arguably one of the top 10 dive sites in Australia! Below pic from Wooli Dive. Whilst most of my diving in the Solitary Islands Marine Park has been the northern section, when I dive the southern islands and reefs I always dived with Jetty Dive and whilst there are alternatives in Coffs Harbour, I can happily recommend Jetty Dive. 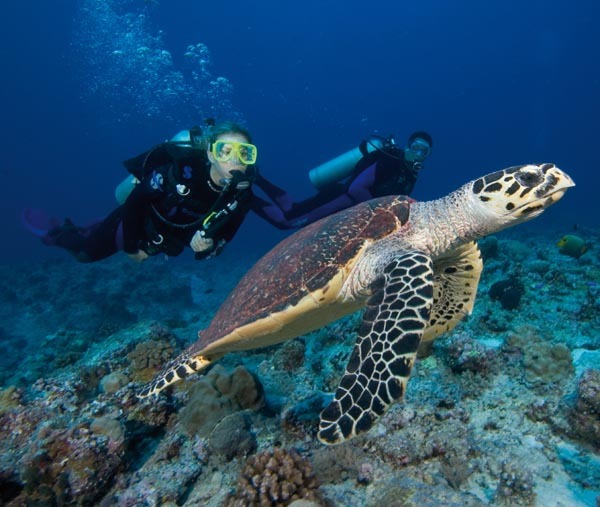 Just 35-40 minutes from the coast, "South" boasts nine fantastic dive sites, with Grey Nurse Sharks, Blue Groper, Lionfish, Morays, Nudibranchs, Cod, Turtles, Giant Cuttlefish, and a vast array of Tropical & Subtropical marine life. 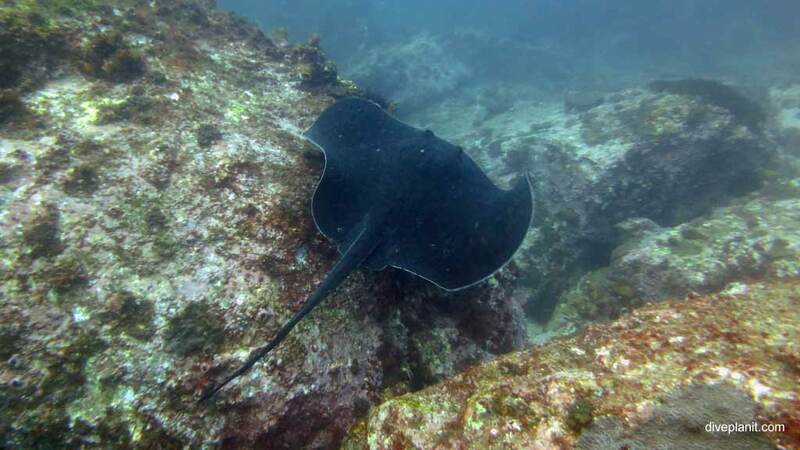 Typical marine life found around South Solitary Island includes Blue Groper, Grey Nurse Sharks, Wobbegongs, Shovelnose Rays, Bull Rays, Eagle Rays, Loggerhead Turtles, Frog Fish, Angler Fish, King Fish, Banner fish, Jewfish, Trevally, Wrasse, Moray Eels, Giant Cuttlefish, Blue Tangs, Clownfish, Nudibranchs, and the list goes on and on…Have a look at this turtle Video! In this area, the bottom is sliced by gutters radiating out from the shore in depths from 10 - 18m. 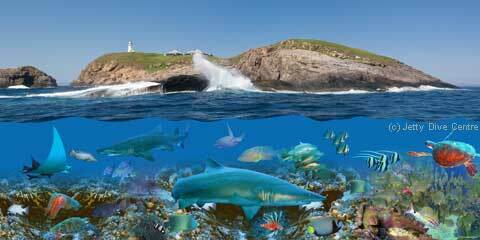 This area is well known for it's abundant fish life and sightings of Grey Nurse Sharks. Schooling King Fish, Golden Trevally, Jewfish, Nannygai and Banner fish are often found in this area. Scattered amongst the boulders you will find anemone and clown fish, Blue Groper, Flute Mouth, lots of wrasse and bushes of black coral. 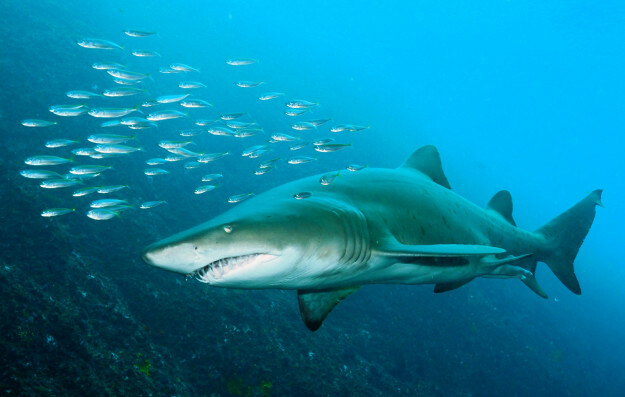 The Light's SHARK DIVE, with in excess of thirty Grey Nurse Sharks at one time, this dive is sure to get your adrenalin pumping. Situated near the northern tip of the island, there is an underwater arch surrounded with boulders and ridges peaking at 15 meters with gutters tailing down to 30m. 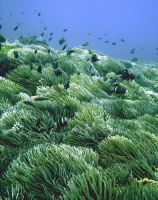 The area is covered with large anemone baths and different varieties of Clownfish. Towards the island, from the arch, there is a pile of boulders in less than 21m of water, this is the best place to watch the masses of schooling Pelagic fish. If prolific fish life is your liking, this dive is for you. Large boulders litter the top and cascade over the edge of the wall, levelling out to a comfortable 18m. This provides a perfect base for Crayfish to hide and corals full of tropical fish like Blue Tangs to thrive. 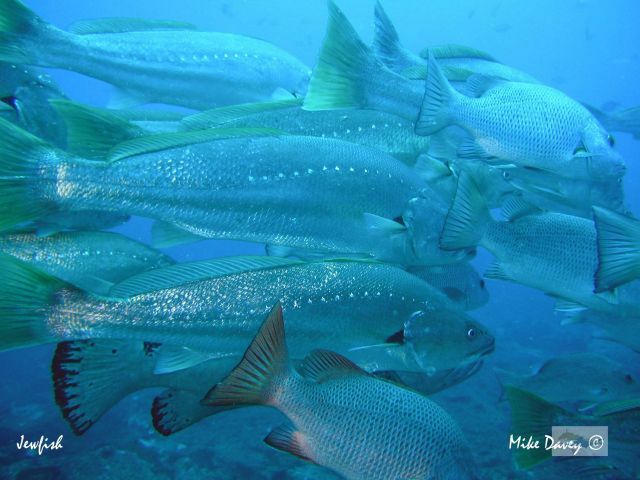 Schools of fish are abundant with Trevally, Mackerel, Bonito and Snapper to name a few. 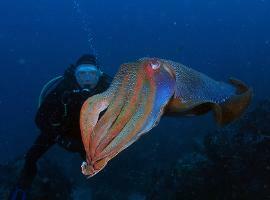 During the winter there is frequent encounters with Giant Cuttlefish along the wall which entices turtles to the island. The site where the old Gantry crane for loading supplies onto the island collapsed into the water. A great shallower dive 12-15m, with lots of marine life and wreckage. Towards the southern end of the island, there is a wall on the south-west side of a rock mass starting at 15 meters, and ending at 30 meters. Schooling Baitfish provide perfect conditions for the ever present Lionfish. Also a brilliant night dive, this is a good area for invertebrate life, including Nudibranchs, Spanish Dancers, encrusting soft corals and anemone with clouds. In addition the cleaner station itself, Barnie the turtle, and Charlie the Blue Groper are regular friends to visit here. 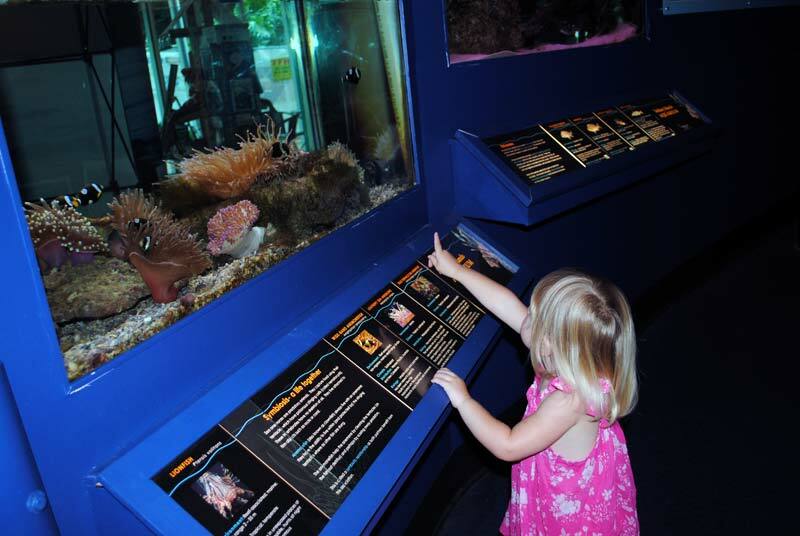 Along with an array of marine life in the gutters and boulders, including Anglerfish, Black Cod and Frog Fish. Site 10m – 18m. Just along from Buchanan's Wall there is a boulder pile and associated rock masses. There is the remains of old trawl cable draped around the area, hence it's name. This is another good area for fish and sightings of Grey Nurse. 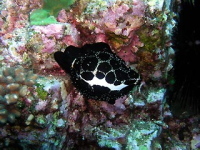 There is a large Black Ray residing in the area and Cuttlefish are often seen here. All images below are from Jetty Dive. Famous for its Soft Corals, Cowry shells, Turtles, Morays and Lobster – “Split” offers a further fantastic Nine snorkelling and dive sites – only 20 minutes from the Harbour. If it's coral bottom cover and invertebrate life that you're after, then Split Solitary is the place for you. The island lies 4 miles north of the harbour. 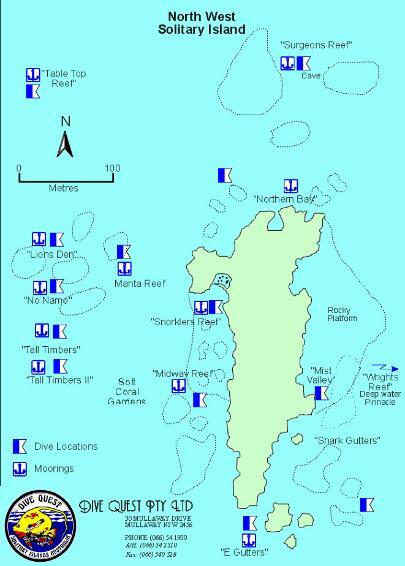 These dive sites are all on the south side of the island along an irregular drop-off. This marks the edge of a plateau about 10 meters deep running out from the island. 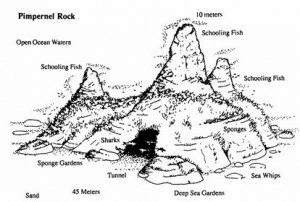 At the foot of the drop, 15 to 18 meters down, the bottom is flat, slowly becoming deeper with occasional rock outcrops. On the plateau and along the drop-off the bottom is covered with hard and soft corals, sponges, ascidians, bryozoans, tube worms, algae's and nudibranchs. 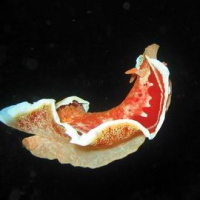 Also you will discover many species of resident fish, egg cowries, moray eels, banded coral shrimp, etc. Lies on the south-east side of the island opposite the "split". This bommie is separated from the fringing plateau by a gutter around 18 meters deep. This bommie rises to about 14 meters and then drops away to 21 meters. A large black cod around 2 meters long has been sighted here on several occasions, also blue devil fish are common hiding under overhangs. There is a second bommie just to the north which is always covered in red morwong. Located on the north western corner where the bottom is in general flatter than the other sites. Here we have kelp beds and profuse growths of plate coral growing only a few meters apart. The underwater terrain is shaped like a series of bays separated by rocky headlands in 10 to 15 meters of water. The bays are covered in corals while the headlands are covered by other invertebrate life. Out in deeper water (18m) there are kelp beds which seem to attract turtles who are frequently seen sleeping in the shallows.